I’m not going to lie to you, dear reader: Tegan & Sara aren’t a band that I can really click with. It has been pointed out to me that this makes little sense: considering the music that I have sewn into the fabric of my life, it comes as a surprise to a lot of people that I never quite made the Alberta natives a bigger part of my life. It could have been something that could have happened once upon a time, but the sad fact is, they were unceremoniously ruined for me by a friend who decided that they were one of the only bands worth talking about, and she would talk about them ceaselessly. This isn’t my fault, and it isn’t theirs. I have a lot more friends who adore them now, so it has become necessary to at least put on a smile when listening to people talk about them. It’s not that they aren’t a good band, they just never weren’t for me. But, I am a professional, and seeing as how they had a new album out, I figured it was about time to set aside those prejudices and give them a fair cop. And, dear reader, I’ll admit that I really do enjoy the album. Heartthrob is album number seven for the duo, and as such, there’s no real need for an introduction, is there? So let’s just talk about the thing: for one, there’s a definite love of the 80s here, and it’s clear that the sisters Quin just couldn’t shake that. Admittedly, I skipped Sainthood, so I don’t know if the synth-beats and the dancefloor-ready bangers are part of the norm these days, but to me, it actually suits them incredibly well. As of this moment in writing about the record, I’m about halfway through listening through again, and thus far, my left leg has not managed to stop bouncing. This is definitely a good sign. But does that mean it’s a good record? It certainly helps. Heart-on-sleeve dance music is, as you may know if you’ve read my reviews, like catnip for me. Tegan & Sara have made the heart-on-sleeve part their bread and butter over the last two decades, so adding in the rest of it just adds fuel to my fire. The minute I really got into their particular brand of it was on the ridiculously good “How Come You Don’t Want Me,” a song that is exactly two minutes too short: “I can’t say that I’m sorry, for loving you and hating myself.” It’s a line that hits close to home for damn near everyone listening to this song, myself definitely included. This is a song that comes from a place of shame influenced by an external force, and the tightrope act involved in making a song that catchy out of hurt that deep is an incredible song. But here’s the thing: that happens all over the place here. Anyone who has been listening since they first heard So Jealous in middle school is likely scoffing at that thought, but for me, this is all new stuff. Even the songs that come from a place of unbridled love are undercut by a tinge of regret, and a desire to cover up old wounds: “I won’t treat you like you’re oh-so-typical,” they sing in the chorus of “Closer,” which opens the record. It’s a line that comes off as a sweet nothing if you aren’t paying attention, but from the right mindset, it’s hard to not want to be the person hearing someone telling them that. And that’s just two songs on this record. That’s not even bothering to talk about “I Was A Fool” and its soaring chorus and its twinkling piano line, or the vaguely claustrophobic “Now That I’m Messed Up, which steals a trick or two from the Bright Eyes handbook, which flows into the pounding synths that cool down over the course of the album’s lonely closer, “Shock To Your System,” with its truly heartbreaking refrain: “What you are is lonely.” Time will tell if this album is a classic, but a lot of the time, it feels like it has a fair few of the markers of being one. It’s a hard thing to pull off a record like this. 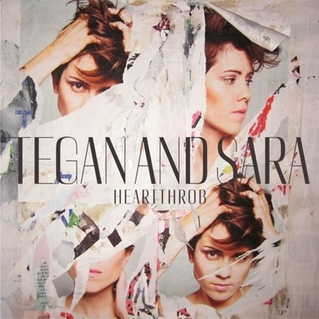 To make pop music, you have to cover up the worst parts of life, but Tegan & Sara make it seem incredibly simple on Heartthrob, just like my personal heroes of therapy rock. This is an album that makes you want to put on spandex short shorts and dance with someone who probably gave you a fake name, and is definitely wearing some kind of body glitter. It’s an album that is influenced by a desire to escape real life. And, just like real life, even the most resplendent moments let sadness in through the cracks. It’s an awesome record. Now get off my back already.